My dreams are coming true and yours can, too. I am on my way to becoming a mermaid, especially now that I have my very own Finis Mermaid Fin! When we were younger, my sister and I used to play in the pool and pretend we were mermaids. We had to keep our legs together as one fin or swim only with our arms. Raise your hand if you know what I'm talking about. 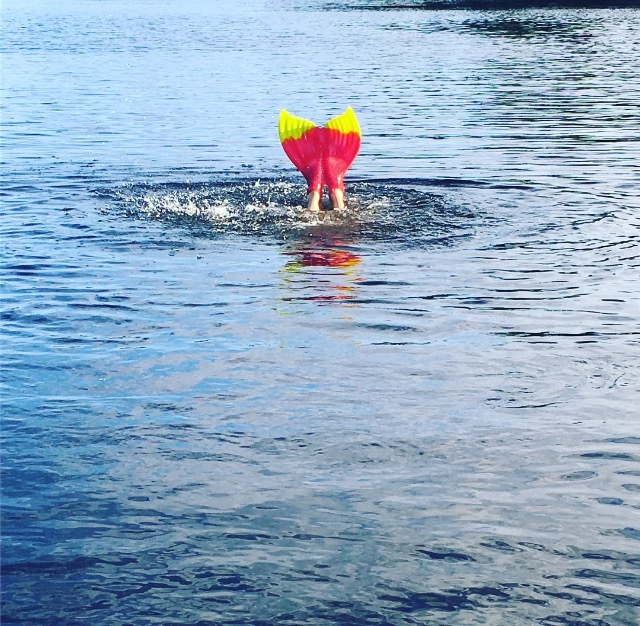 When I put on my Finis Luna Mermaid Monofin it was just like that, only better! Not only did I look and feel like a mermaid but, I swam like a mermaid, too! However, this beautiful swimming equipment is not intended for novice swimmers. 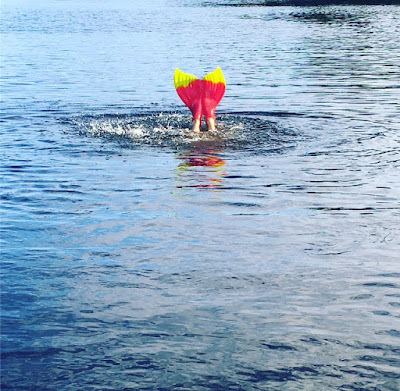 Since I am a pretty strong swimmer, I caught on quickly and learned to "become one" with my mermaid fin. I have to admit that kicking my fin out of the water in the photo above was a lot harder than it looks. I think it'd be a fun swimming workout for your summer bikini body. There are plenty of monofins to chose from but let me tell you first-hand why the Luna is the way to go. It is the longest and most "realistic" monofin, constructed of flexible and durable silicone. It has separate foot pockets for comfort and swimming ease, with adjustable straps. I wear a size 7 in flip-flops and the size small pink-ish "Mystic Melon" Luna fits me perfectly. (The size medium is blue and green.) It has a crescent shape with rippled edges, which also provide graceful movements like a mermaid under the water. Every detail has a reason and purpose designed thoughtfully by Finis industrial designers and product developers. Finis, Inc. is a spectacular company! Made up of water-lovers, swimmers, inventors and do-gooders; it's the type of brand I love to support. Visit the design lab for custom swimwear, shop for all your swimming needs, join the community for workout tips or literally become a mermaid. You'll have to see for yourself as you glide gracefully through the water wearing your newest swimsuit and the latest monofin. You can learn a balanced dolphin kick, build strength and get your perfect swimwear accessory. It is available for pre-orders only because it has not been released yet. You can get the special discount price of wholesale (only $45.00 instead of $89.99) if you get your orders to me before the end of April! 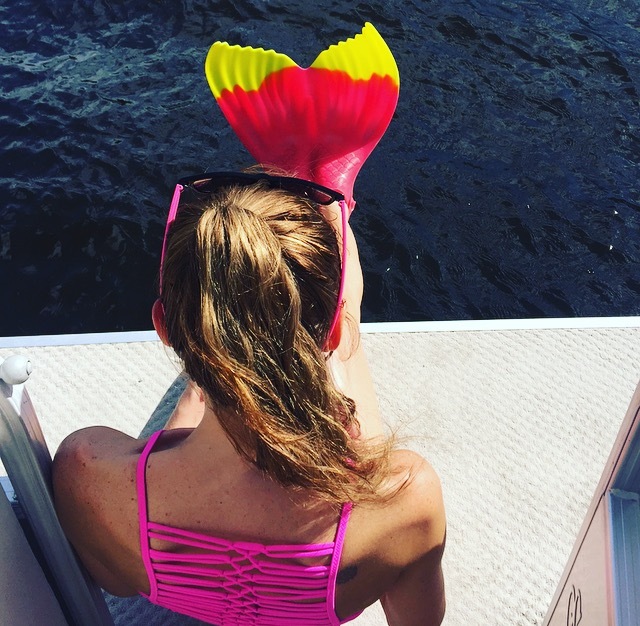 Let me know if you are interested and we can get you a mermaid fin before anyone else!